Hope's Cafe: UPrinting 18x24 Poster Print Giveaway!! Well, I was recently given the unexpected opportunity to host a UPrinting giveaway here for you all! I have heard a lot about UPrinting, but didn't realize what a broad range of products they offer! 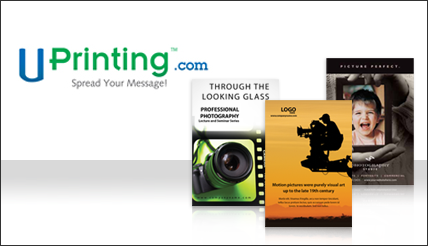 UPrinting is an online printing company that can help with all your advertising and promotional needs, as well as if you just want some custom postcards, address labels, greeting cards, print posters and more. They have great low prices, and even offer to match a current lower advertised price from other online printers! "UPrinting is a professional online printing company that provides commercial and small business printing. Our online printing services help you print full color brochures, fashionable clothing hang tags, attractive door hangers, customizable folded cards, appealing greeting cards, mailable postcards, and promotional calendars. We offer quality card calendar printing, poster calendars, and wall calendars. Club card flyers and menu printing services are also available online. We offer rack cards, digital, offset, and mounted posters, low-cost flyers, high-quality newsletters, and event tickets. For multi-page prints, we provide catalog printing and booklet printing. Promote your business identity through online business cards, flyers, greeting cards, and hang tags. Print online to produce professional stationery with letterhead printing. Match your letterheads with envelopes created through envelope printing, or use professional pocket folders. Create labels through sticker printing and custom label printing. UPrinting canvas printing creates stretched canvas or rolled canvas while banner printing creates durable vinyl banners. Print large format static window clings and custom size wall graphics, ideal for decorations, and POP (point of purchase) display. Online discounts help you save more on printing. Use UPrinting discount coupons and take advantage of our promotional offers. Send out marketing prints with our fast, easy, and affordable mailing services. Check out articles, print samples, videos, and blogs for tips and ideas on creating prints online." UPrinting offers a free proof before shipping so you know exactly what the finished product will look like, and it also gives you the chance to correct any typo errors, etc. before the product is printed! UPrinting is giving an 18x24 semi gloss/high gloss poster print to one of my readers! Go to Uprinting and tell me another product you'd like! This giveaway ends Saturday, August 28, 2010 at 11:59 p.m. Please leave a valid email address in each comment, as this is how the winner will be notified. Winner will have 48 hours to respond, or another winner will be chosen. Giveaway open to US residents only. Disclaimer:I was not monetarily compensated in any way for this post. All thoughts and opinions are mine. All quotes taken from the UPrinting website. I love the Card Calenders. I really like the Wall Graphics. Would be great to make your own designs to put on the walls! I'd love to try their hang tags! Our wedding is coming up and those would be great for favors! I love the greeting cards! Entered the writing pen store giveaway. The personal experience of an artist on different modes of poster printing of a certain type that provides more facilities.